From the big city to the coastal beach, this New York City couple invited elegant simplicity and natural beauty into their Jenne Farm wedding on Whidbey Island near Coupeville in Washington state. Actually a commitment ceremony rather than a wedding, the day commenced with relaxed preparations in an old farmhouse, which added rustic charm and genuine appeal to this simple event. Love, enjoyment and appreciation were in the air – rather than rush, panic or worry. I enjoyed seeing this couple at ease in the elements and with each other. The magical moments to remember included an emotional ceremony that was held near the beach of Ebey’s Landing, Fort Ebey and Puget Sound, where the scenery swept everyone away and created an enchanting background for this Jenne Farm commitment. In this image, you get a glimpse of the couple as they stole away for a few moments to revel in the sunset and each other. The soft hues of nature only serve to emphasize the strength of this couple’s connection. The perfect day concluded with a low-key reception and celebration at the base of a giant red barn in the area, showing that urban and rural truly do mix. 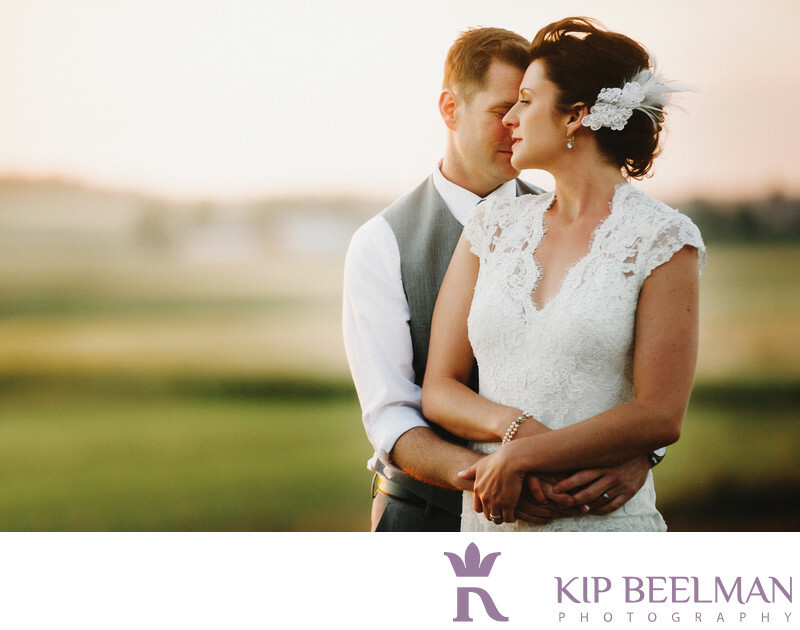 This image simply captures the romance and beauty of the day and of this couple. I love the obvious affection this photograph shares, and I loved sharing in this beautiful and emotional event. Hands, arms and lives interlaced. From Jenne Farm weddings to commitment ceremonies and from city to country, I enjoy capturing the small moments that create the larger significance in love and in life. Location: 538 S. Engle Road, Coupeville, WA 98239. Keywords: Coupeville (3), Farm Wedding (21), Jenne Farm (3), Outdoor Wedding (72), Whidbey Island (3).